I'd love to see YOUR pics, and I bet others would too, so please send 'em my way! Like the great Mel Lewis said: "They're back!". A million thanks to Tony." 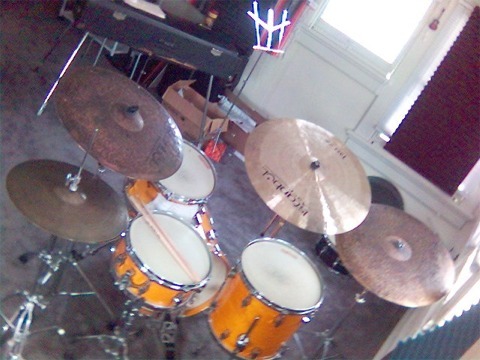 Btw, the cym on my left is a vintage 20" A Zildjian I found in NYC for $60 (!) at a used music store. I put 2 rivets in it and it just sings, baby! -- a perfect complement to the Sultan. 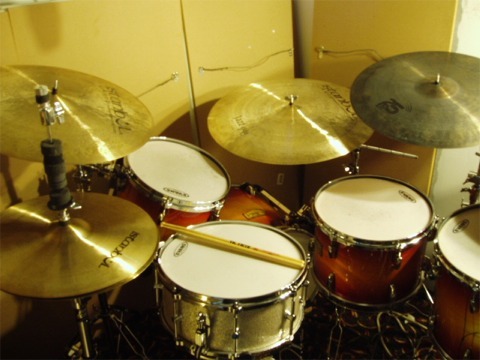 The crash to my right is a 17" K Dark -- very nice too, but I'd like to maybe cop an Istanbul crash to mix with the Sultan. 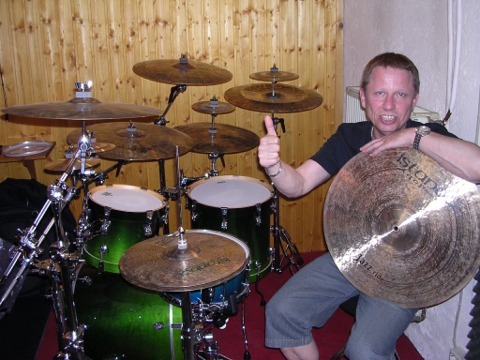 Paul proudly shows off his new kit and Bosphorus Cymbals. Sans-labeling (I love the clean look!) is a Bos 14 Masters and a 20 Masters. A 21 Antique Original and a 22 Masters (not pictured) rounds out the setup! Alex displays his set of luscious Empires and Sultans, capped off with a 6" traditional splash. He says, and I quote, "They're fantastic!" 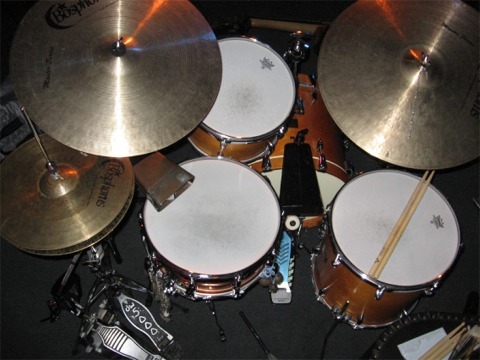 Here's a killer view from the driver's seat of Mike's kit! 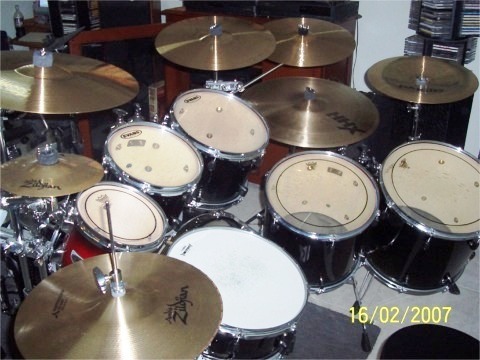 20 sultan jazz, 14 sultan crash ,13 sultan hat/dynobeat bottom, 10 trad splash, 18 sultan crash, 10 sultan splash, 17 sultan crash, 12 sultan splash, 16 sultan crash, 22 sultan ride, 13 sultan hat /13 K bottom, 12 trad splash, 18 K custom crash, 17 K china. Yes, you guessed it! 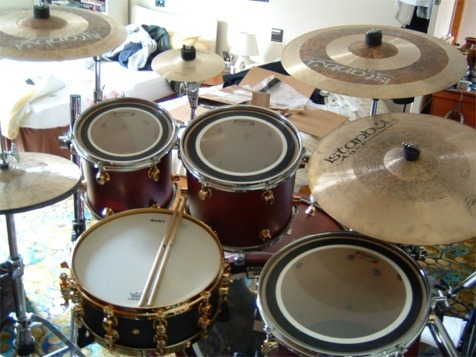 These are custom Tempus drums with gorgeous black hardware. Marty picked up a set of Sultans and Turks to go with them...or was it the other way around??? Steve shows off his new Agops! Will displays his new tins - a matching set of Agop Signatures! about them that will cut through a mix really nicely. As for that crash....WOW. 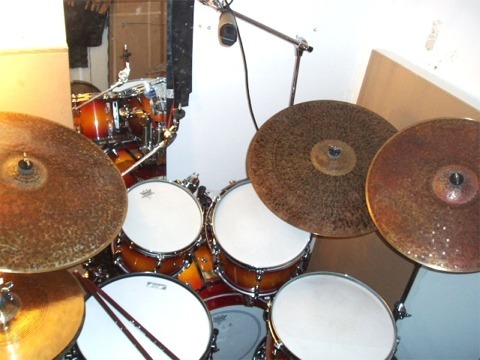 I don't think I could imagine a more pleasing cymbal. It's just so....PRETTY. There's absolutely nothing "noisy" about it...it's just warm and musical and soft and...WOW." 13 Agop Sig hats, 18 Bos Masters Crash, 22 Agop Sig ride. 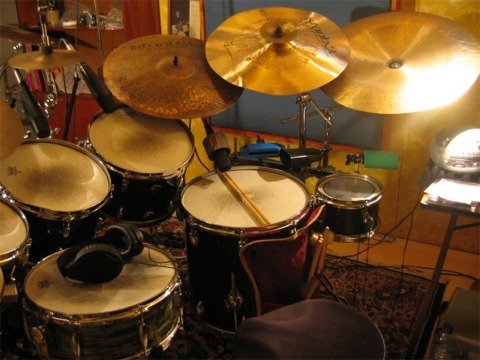 Looking like a Bosphorus ad, Bill calls his cymbal setup a "work in progress." There's a 13 Trad hat, 20 trad flat, 17 trad Med-thin crash and a trad ride pictured here. Apparently David likes to live dangerously, because he tells me getting this pic wasn't easy due to the fuel tank that's located just behind him! (Yikes!) Displayed here among others is a 16 Agop Turk, 8 trad splash, 15 Alchemy medium crash, 18 Sultan Crash crash, and 21 Agop Turk Ride! 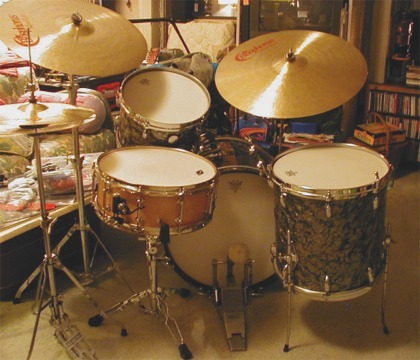 Frank shows off his gorgeous vintage Luddy, and some of his newly acquired 14 and 21 Mel Lewis Agops. 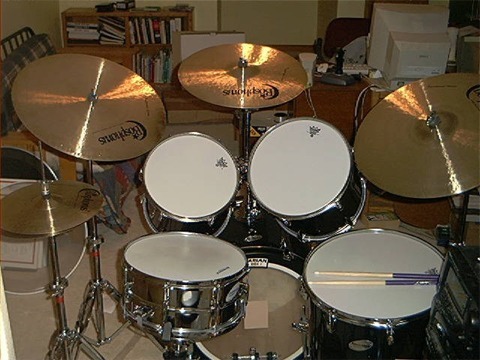 Nice kit Frank! - thanks for the pics! 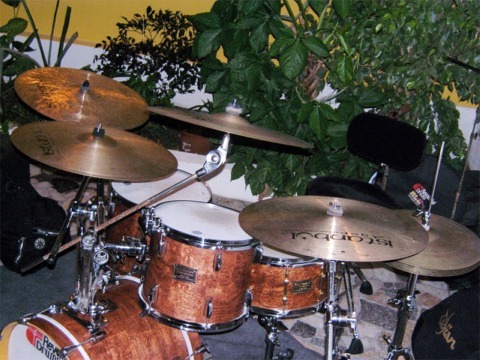 Mario says, "Here is a close up of the 24" Istanbul Agop Signature ride, and also my drum set...The Agop is not only beautiful, but it complements my 22" riveted Bosphorus "The Hammer" ride beautifully...It has great stick definition, and it's as mellow as anything I've ever played...It is everything you said it'd be...Thanks Tony!" You're very welcome, and thanks for sharing the pic, Mario! Enjoy! After searching for months to find a replacement for his Agop 8 heavy splash, Rick exclaims with excitement, "Well My 8" Splash has arrived today !! Just getting home from playing tonight. It sounds GREAT !!!!!! I Love it !!! WOW Did I miss it. I don't think that I have ever missed a sound so much before." WOW! This photo looks like it came out of a magazine ad - nice job Ren! This super-dark setup is made up of 13 Turk Regular hats, and 19 & 20 Turk Original rides, and look stunning against the green sparkle DWs! 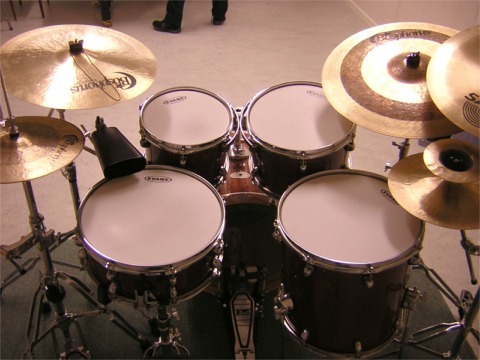 14" Istanbul Signature hats, Istanbul pre-splits in 16"crash, 12" splash, 18" crash, 22" ride, 20" Bosphorus Versa flat, and 17" Pre-split Istanbul crash over top of a Mapex Orion Studio kit. 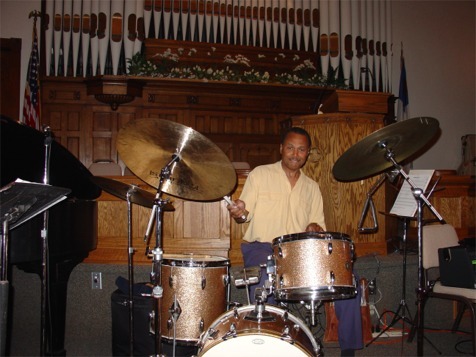 He also adds, "There's nothing quite like playing instruments that inspire you! Thanks again for the great instrument, superb advice, and fast shipping." - so true, so true. 18" Sultan crash (btw Wow!)" Tibo's set consists of 14 Trad hats, 22 Sig, 22 Sultan China and an 8 trad splash. He exclaims, "They sound so great!!" 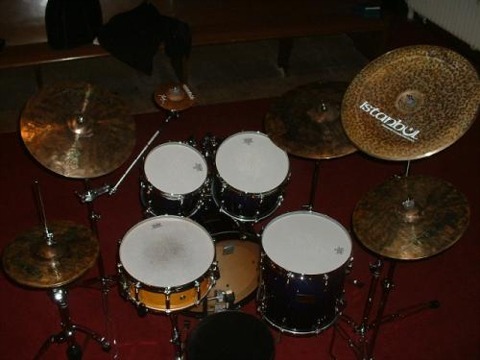 Oksant would be very proud of Dave's setup, especially that custom made "Frankenstein" hi-hat clutch. :) Handling the ding-dah-da-ding is a TW and a 20 SE. Excellent! 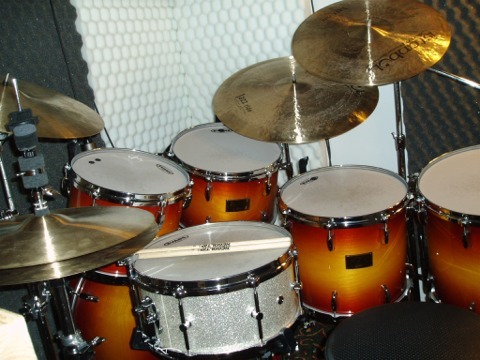 Dave from England sends me this pic of his set, complete with 16 and 18 Agop Dark crashes. He didn't mention that he had 3 feet? :) Dave, you gotta share how you use those pedals - very interesting arrangement! stock. 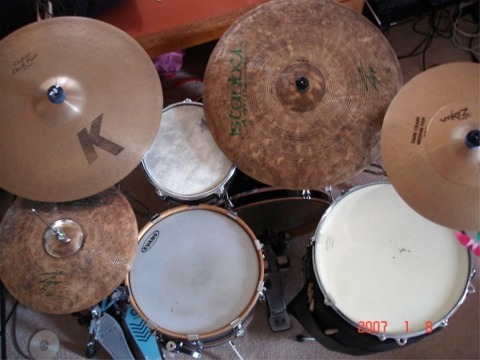 An 18" china, from the K custom series, as well as an old zildjian K ride." 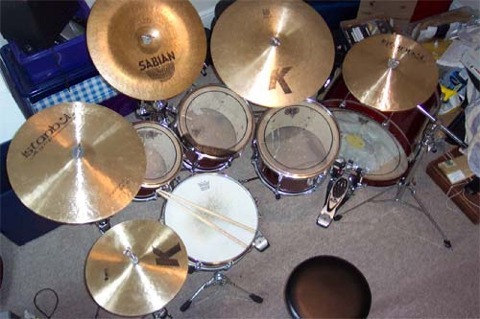 Scott's got a big, gorgeous kit, with cymbals to match! Agop sultans, and Bos Antiques mixed in with some of what he calls, "Evil Meinls," that are targeted for replacement soon! 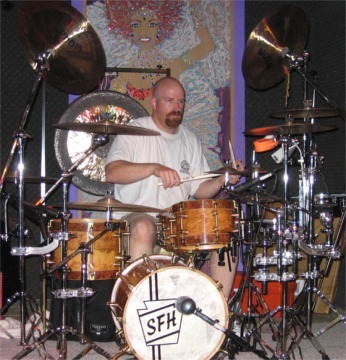 Love the pic, Scott - every time I see it, I think of those huge tom rolls! "The 22" Turk has found a great new home.... It's AWESOME! It's amazing how articulate it is despite it's thinness. Plus, because it's so thin, it crashes wonderfully. It's totally amazing! I love it. It's beautiful, too." On the left is an 18 Antique Jazz C/R. 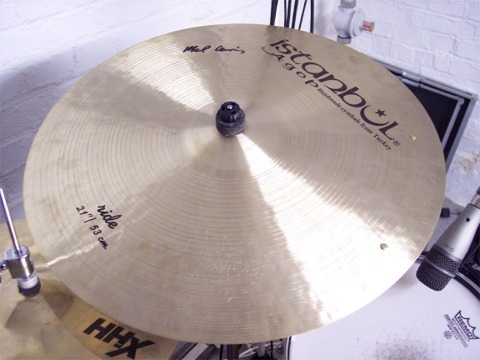 Once again cheers very much for such a wonderful cymbal. I'll certainly be using you again! 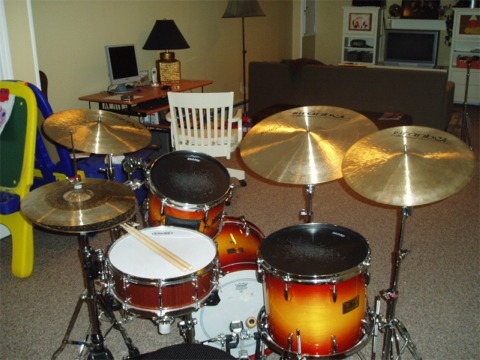 While waiting for forever for his cocktail drums to come in, Brad sent me a shot of his current kit. He promises to send another when the Yammys show up! I can't wait to see that! exceed all expectations. 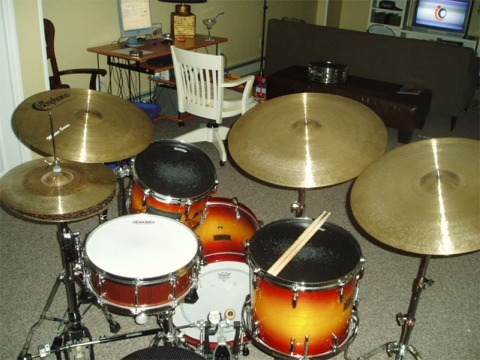 ( 22" Turk Ride, 22" Sultan Jazz Ride, 22" Sultan Flat Ride, 14" Turk Hi-Hats. )." He also says, pics of the whole set with the latest "add ons," are coming! it feels like I've been playing them my whole life. 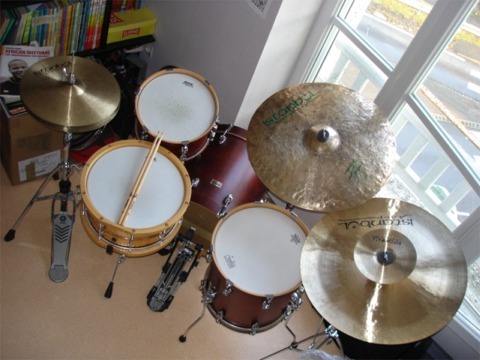 green Ayotte kit with (left to right): 15"
traditional hi hats, 20" Pang Thang prototype, 22"
with this cymbal setup or some variation thereof. This is Darryl's set, (the great guy who supplied the awesome factory Bos pics and videos.) Many of these pictured were selected on that trip. 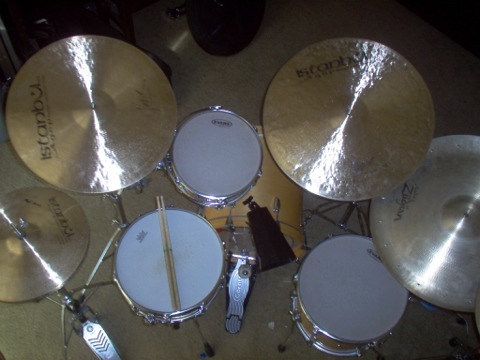 The cymbals are (from left to right) 22" New Orleans ride, 14" NO hats, 10" Trad splash, 20" Hammer ride with 3 rivets, 8" Istanbul, 20" Stanton Moore Pang Thang with 4 rivets, and a 16" NO crash. 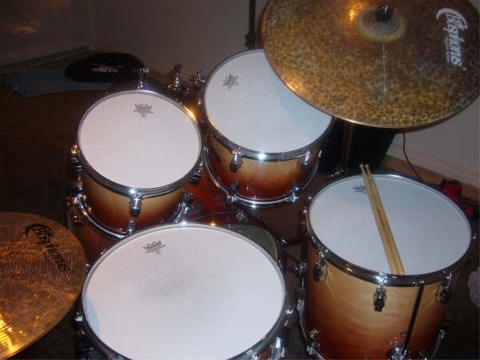 Long time since I ordered these from you, but I thought I could send you some pictures of my kit. Hope you like them. Andrea from Italy send this nice set pic! 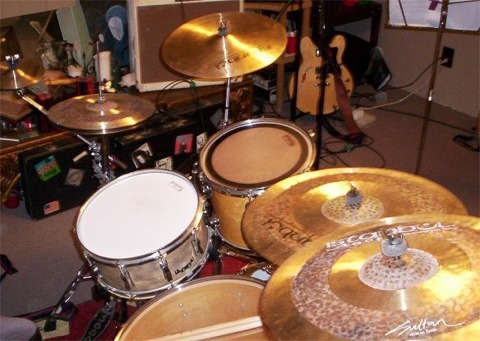 Hi Tony, The cymbals has arrived and it sounds wonderful! 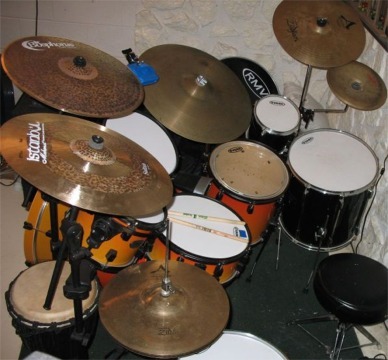 Thank you, here's a pic of my cymbals set-up. 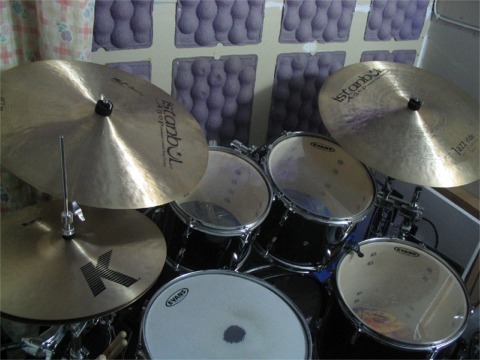 (left to right) 16" Zildjian KCON crashes as hi hat, 20" Bosphorus Masters Series ride, 21" Bosphorus Masters Series flat ride, 20" Zildjian K pre aged w/six rivets. 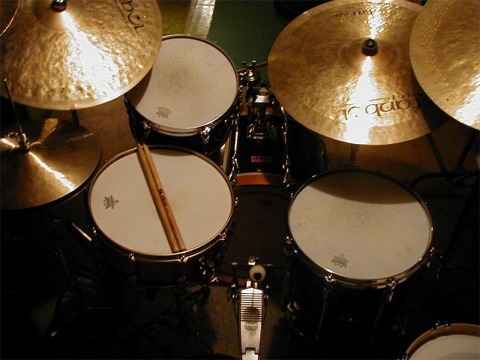 The first consists of various Agop SEs and others, and the second shows of some Bosphorus Stanton Moores - 14 Fat Hats, 20 Wide Ride, and 22 Wide Ride. 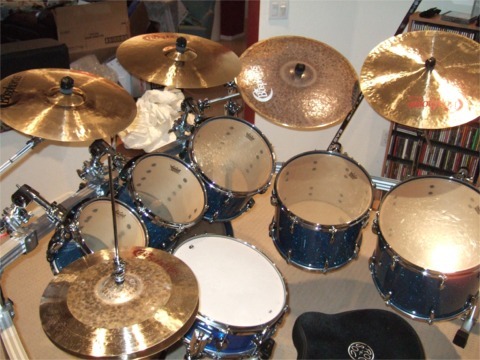 I know he's a Bosphorus Turk freak, like myself, so I'm hoping he'll send me one of those as well!! 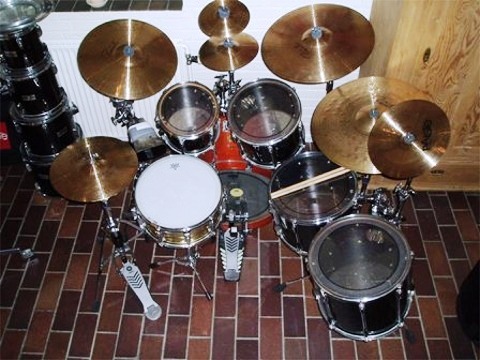 As promised, Here is a picture Of my drum-kit. Thanks Again, The Crash Is Awesome. Mark, like myself, is crazy into Bosphorus Masters Turks. 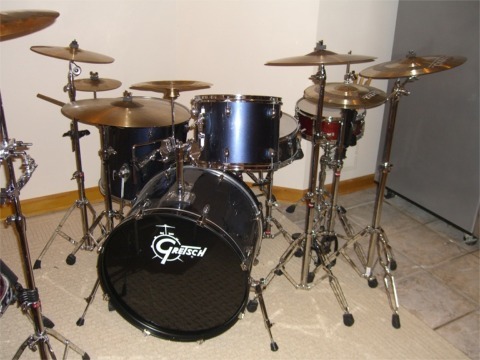 He sends this pick of 3 of them (22", 21", and 21" flat) wrapped around a Gretsch Round Badge kit. Beautiful!! Greetings, here's some pics for you to check out. 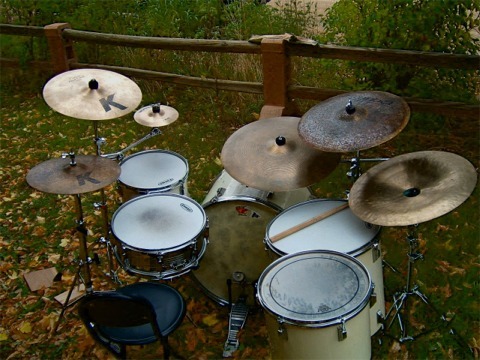 They are of my latest set-up, consisting of Pearl ELX. Here's the following: AGOP-15 custom sig hats, 16 sig crash, 18 sig. crash, Turk 10 splash, 19 sig crash ride custom, 22 trash hit (patina-ed), 19 sig flat ride custom, 18 sig china. Thanks again for the great friendly service. 14 Masters Hats, 19 Masters Flat Ride, 19 Masters Ride, and 20 Masters Turk Ride. 22 Turk Original, 22 Masters Turk Flat, 14 Turk Med Hats, 16 Turk Thin Crash. 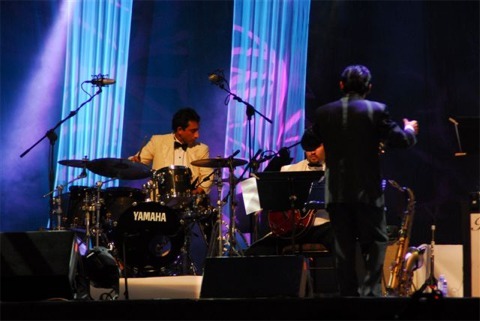 I can't tell you how happy I've been with my Bosphorus big band setup. 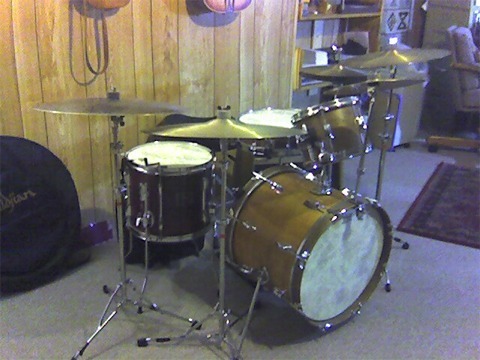 1960's teardrop Sonors 13/16/20", here with a Ludwig hammered bronze snare. 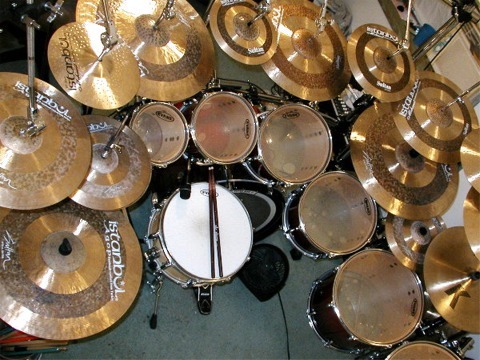 If you look carefully here, Tom's got just about every Istanbul cymbal line represented: 14 Empire Hats, 19 Mel Lewis CR, 18 Traditional Crash and 10 Splash, 16 Sultan Crash, 25th Ride, and 20 Sizzle Ride! He says he loves his Istanbuls! 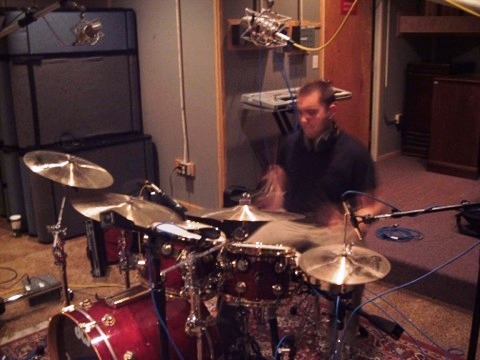 Scott adds great looks, "warm and rich," musical color to his mostly Sabian HHX setup by using a Bosphorus Gold 17" Power Crash and an 18 Antique Thin Crash. John has a healthy collection of wonderful Bosphorus pieces. Unfortunately though, his roadie quit the day before this shot was taken. 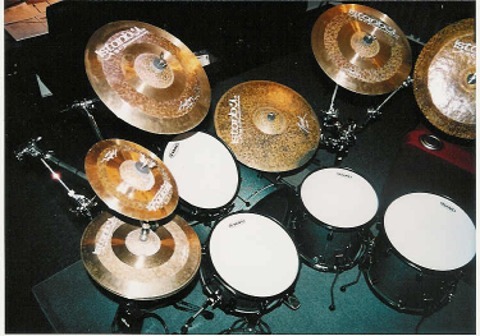 Bob's Corder jazz kit is surrounded by Sabian HH bronze: 14 Hats, 20 Carl Allen Ride, 22 Crash Sizzle Ride, and 19 Med-Thin Crash. He's currently building up a set of Mehmets around a recently acquired 18 Crash Ride. 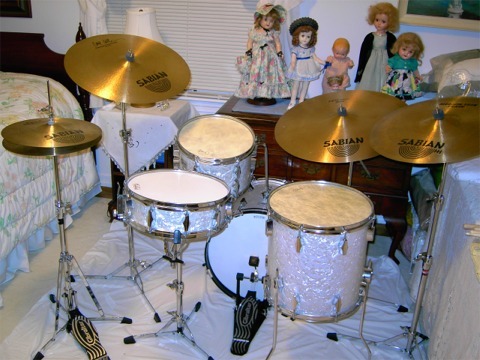 When pressed for comment, the dolls say, "Bob's cymbals sound warm and rich!" David sends me this pic of his Fibes flanked by some large Istanbul bronze. There's a 24 SE, 22 and 20 Turks, and a 15 old K/A bottom hat! 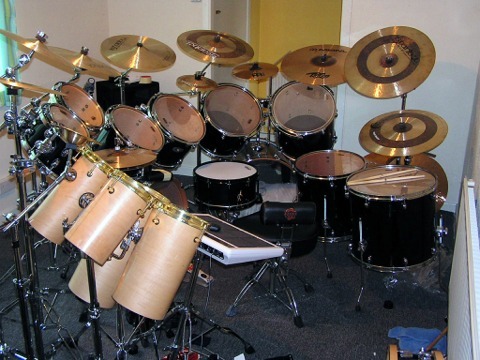 I think Dave's on a quest to see just how many setups he can get pictured in these-them-thar' gallery. Careful observers will notice the margarita in the first pic to be gone in the second! Dave kindly shared his recipe with me <hic-cup>! 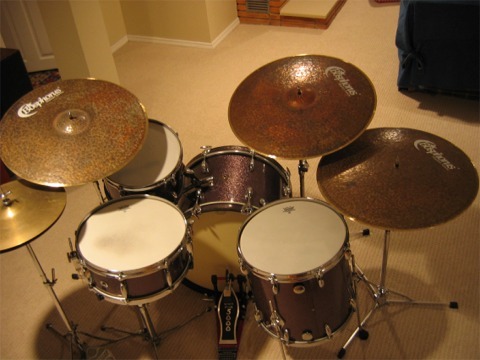 rivets, 17" Dark Crash, 20" Original Ride w/3 rivets and 20" SE Jazz Ride. I take this photo in Olivier Resturante, from Pelourinho Town, Salvador City Bahia Brazil !!! If you like this photo, post in your site !!" I do! Thanks SO much for sharing it! 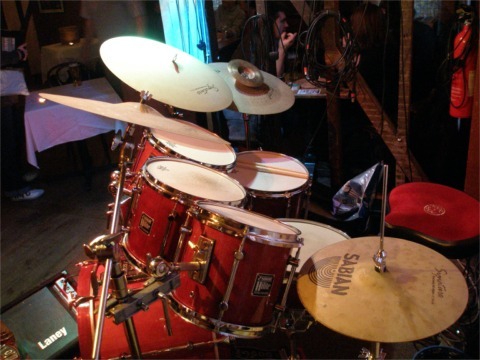 I took a pic of my kit with some jazz cymbals for the "happy customers"
I absolutely love them and they opened a whole new dimension on my set. 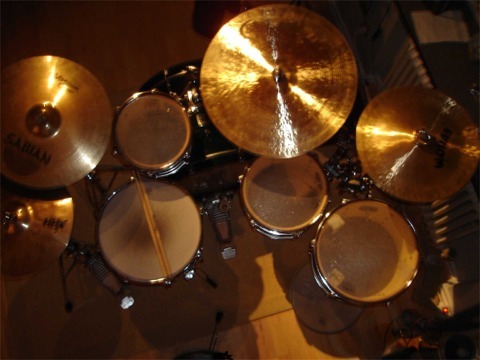 The cymbals changed my perspective on hand-crafted cymbals, for the better! OK, it's official - Guys named Mike have the biggest sets. :P Love it, Mike! Mike (different one that the proceeding pic) sent me a pic of his Late 60's Slingy's with some vintage, and not so vintage bronze to match! Craig from Australia wins the award for the most cowbells. Look closely, and see if you can spot them all! 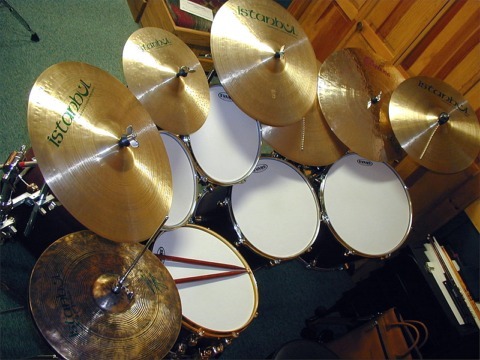 :) Cymbal-wise, in this pic are all Bosphorus Masters: 14, 20 and 22! 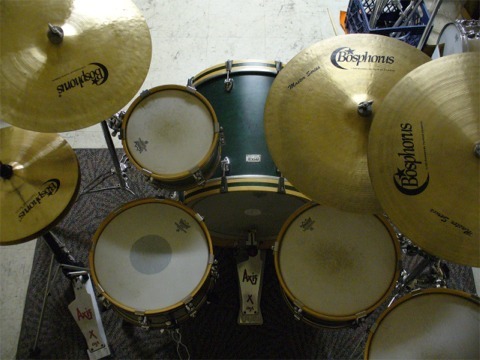 Grant's RMV maple kit features an 18" Bosphorus Turk Crash, and an 18 Istanbul Sultan Crash. There's some uniquely mounted gear here as well! Cool stuff! 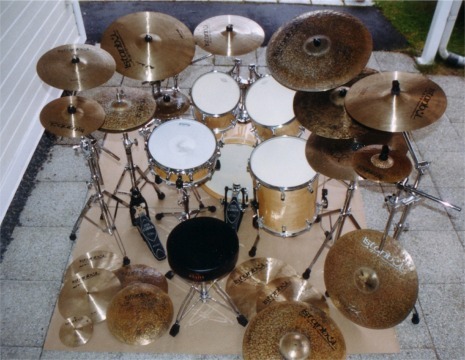 John's kit is simply a stunning piece of art. 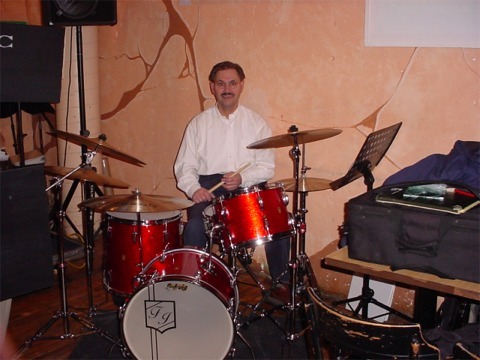 Handling the main ride duties is a 21" Istanbul Mehmet Sultan's Signature, that he says he'll be playing for a lifetime! 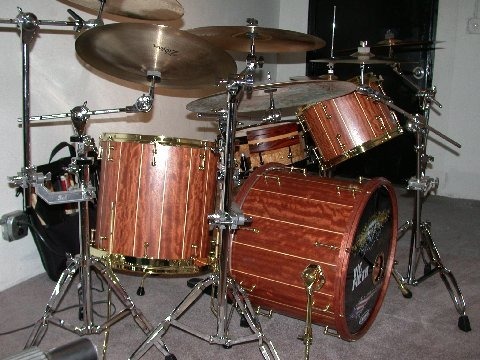 Custom Made Solid Bubinga Stave Drums, Custom Gold Hardware. Thanks so much for the pic!! Michael's set is a drop dead mint '60s Slingy. Man, you should see the additional photos he sent me - wow! All the bronze is Bosphorus masters: 14 hats, 19 and 22 ride, and 18 crash on the far right! 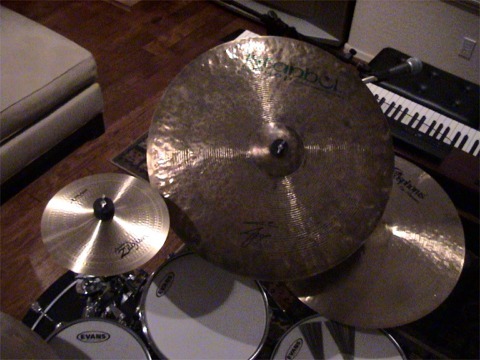 "The big china cymbal arrived in fine shape today. 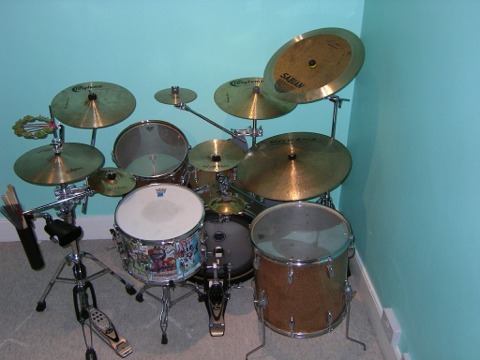 I have attached a picture of my drum kit. 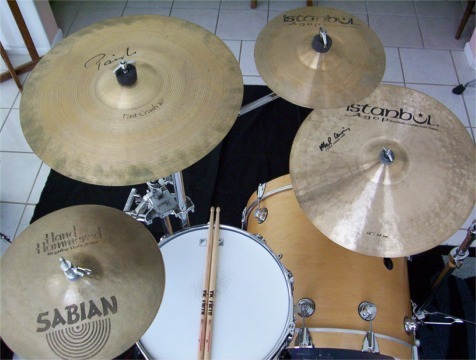 The cymbals: 16, 17 and 18" A custom crashes; 20" A flat ride; 20" A earth ride; 22" Istanbul Agop Turk China; and 14" Istanbul Mehmet Sultan hi-hats. 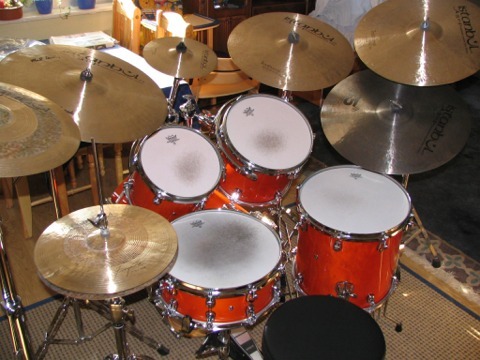 The drums: 12, 14, 16 and 18" roto-toms; 20" x 18" Ludwig reissue Psycho Red Bass; 13" x 6.5" custom burl maple snare. 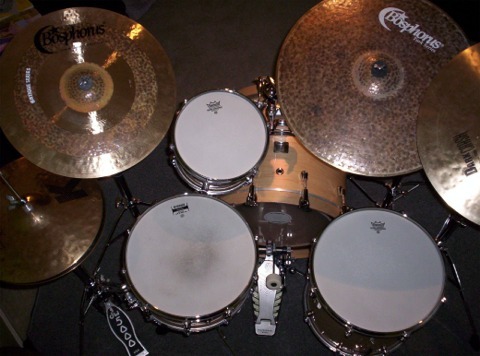 Thanks again for the great cymbals!" Daniel sends this photo from Denmark. 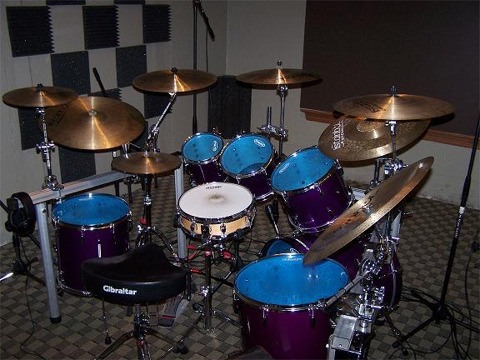 His set is a Yamaha Stage Custom complete with the following cymbals: 14" Sabian HHX hi-hat, 16" AA Crash, Bosphorus Ride 21", 16" Wuhan China and a 10" Istanbul Alchemy splash. He comments, "I truly love my 21" Bosphorus most. I've added one rivet and it just sounds great. " 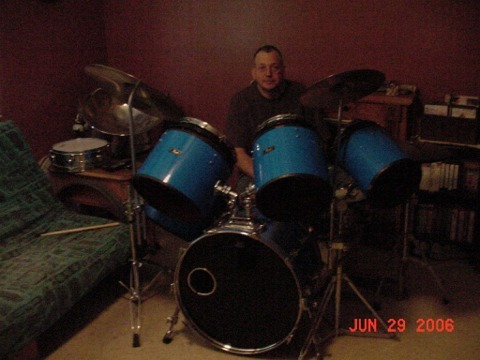 Chuck is pictured here with a very rare Pearl set with heads that can be variably tuned like roto-toms. He's playing a 24" Bosphorus Masters Turk and 14" Traditional hats (among other pieces). 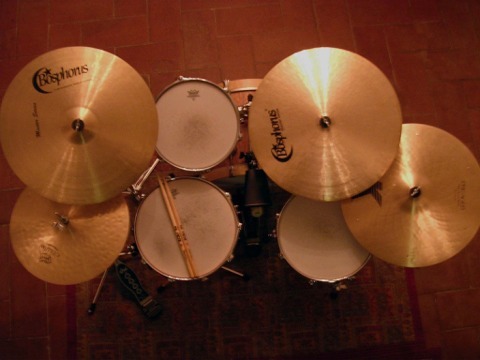 Tony some pics of my jazz kit as promised, the Bosphorus Trad Light Ride cymbal you picked for me is just great - thank you so much, it blends nicely with my Istanbul Agop Trad Ride, and my Turkish Classic Ride with 2 rivets. I'm also using 13" Turkish Classic Hats. 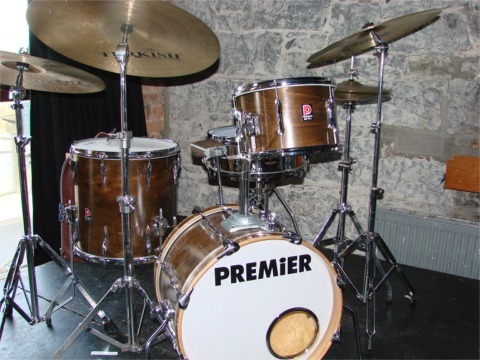 My Premier kit (1978) was originally purple, but I stripped it last year and sanded it down then varnished by hand - 20 coats in all. It came up quite nice, don't you think? 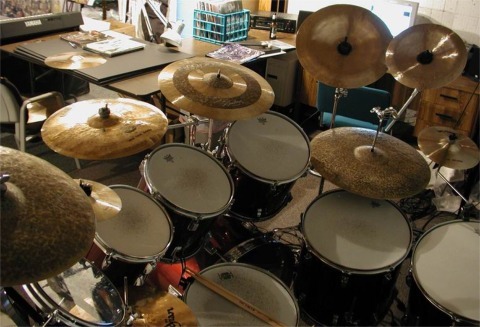 My friend Ben, here, has a problem - it's called a called a cymbal addiction, (in his case, Paiste), and somehow, I think all of us looking at these pics can relate! 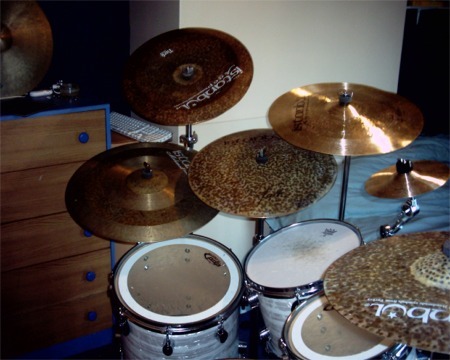 So I gathered some pics of my new cymbals. 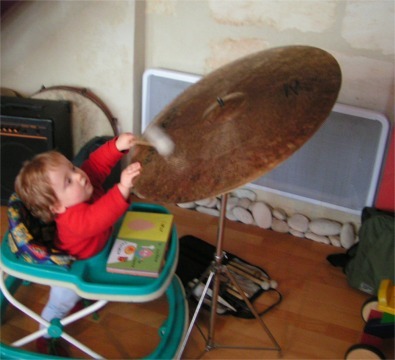 I cannot thank you enough for all your help in the cymbal-selecting process. 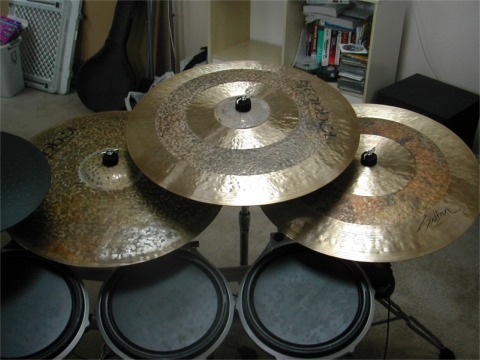 Although I am only 16, I am very particular in my taste in cymbals... and these went far beyond my expectations! 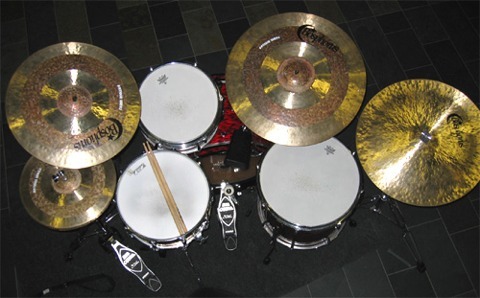 The pictured cymbals are 14" K Custom Dark hats, 17" Antique Bosphorus Crash (med-thin), 21" Bosphorus Traditional ride (med-thin), and a 18" K Custom Dark Crash. 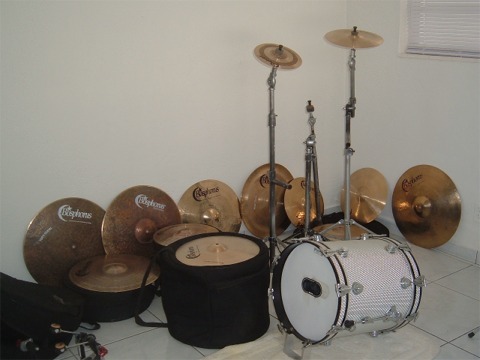 My other cymbals not in the photos are a 20" K Custom Dry Light Ride and a 19" Armand Ride, as well as a 14" Eastsound china and Meinl 8" drumbal. 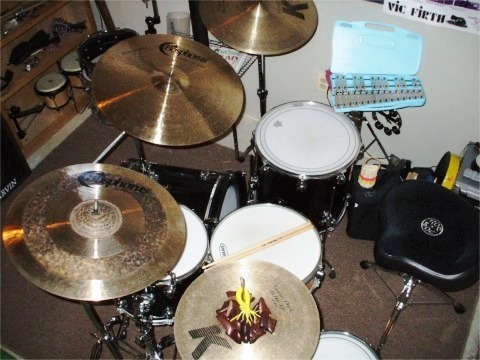 As you can tell I like to add little things to my kit to make it different, such as the leather seeds on the high hat, the angel glockenspiel, or the miniature steel drum from Barbados. 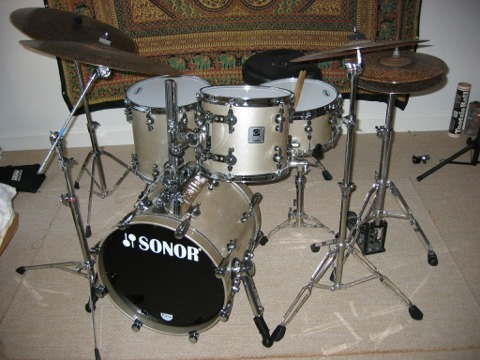 Daniel from Australia just unpacked a shiny-new Sonor kit, and is outfitting it with a Bosphorus New Orleans Hi-Hat, and Masters Turk Ride. 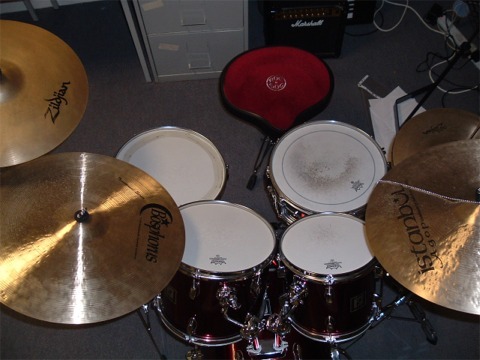 Eirik sends me this luscious photo of his Premier kit, complete with some tasty Bosphorus Masters Hats, Masters Crash, Antique Ride, and Sabian China! 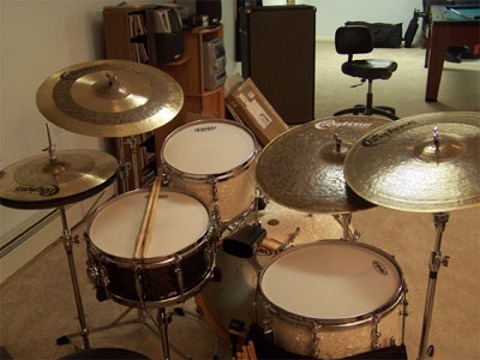 Ernesto says, "I was looking for the perfect ride with no success until I could hear the cymbal before buying, at cymbalsonly.com - the greatest cymbal store... To give you an idea, I've had about 15 rides and this one is the best for me, really! 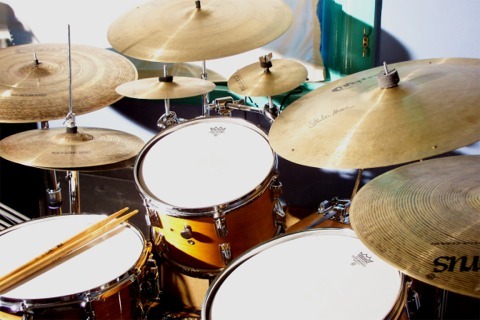 Zildjian 14 mastersound hi hat, zildjian A custom 8" splash, Paiste signature 17" fast crash, Paiste signature 16" fast crash, Paiste traditional 16" thin crash, Sabian HHX 21" dry ride , Paiste signature 16" thin china. 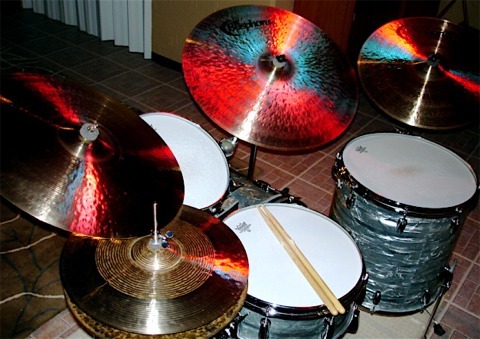 16" Zildjian K Dark Crash Medium-Thin with an 8" A Custom Splash sat on top of it - sounds like a really dry sizzle. medium-tight. 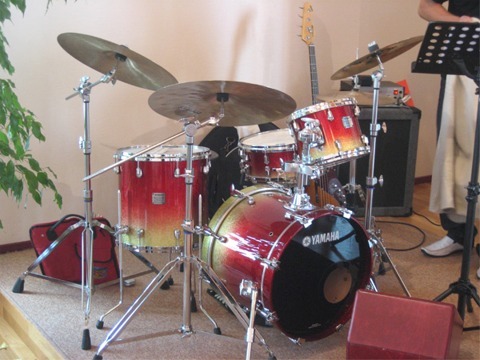 18" Yamaha Rydeen bass drum (I kid you not!) with factory Powerstroke-alike head, tuned medium-tight. 10" Yamaha Rydeen tom with Fiberskyn FA, tuned tight and jazzy. 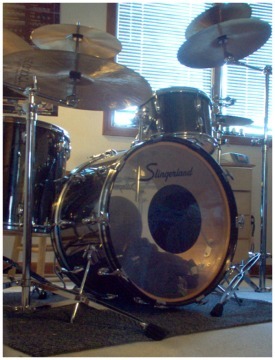 16" Yamaha Recording Custom floor tom with Aquarian American Vintage head, tuned ultra-loose and flappy. 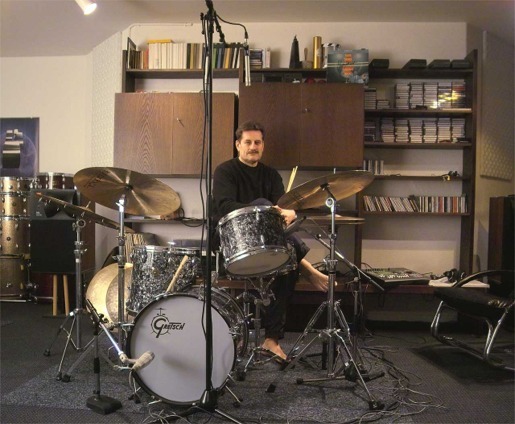 Any of you out there, who's spent time at Berklee, might recognize this room - It's studio 1A, and Jeremy says this pic was taken at about 4AM. (That's some pretty fast sticking at 4AM, my friend!) 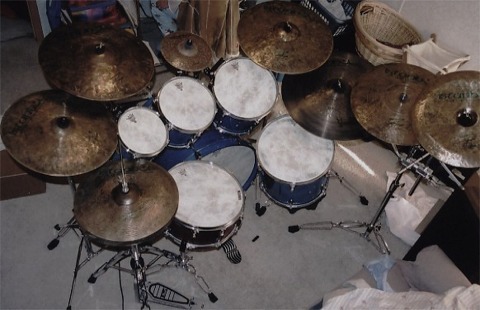 He says, "Here's a pic of those beautiful Bosses on my DW's. 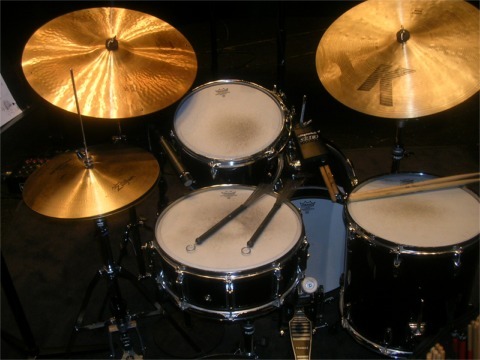 The sound of those cymbals with my drums...it was a match made in heaven!...22" traditional thin ride, 18" masters light crash, 16"traditional thin crash, and a set of 14" traditional light hi-hats....mmm...."
Hi. 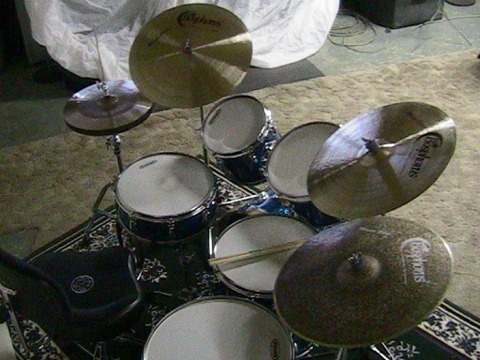 I finally took some pictures to show you the cymbals you sent me set up on my kit. I love the sounds. Thanks again. 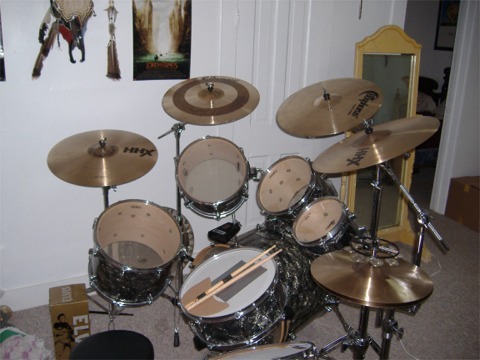 holes), and 20" Zildjian K Light Ride. 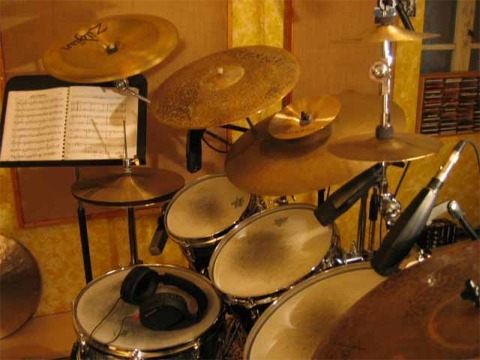 Through this cymbal I can express my feelings so well! 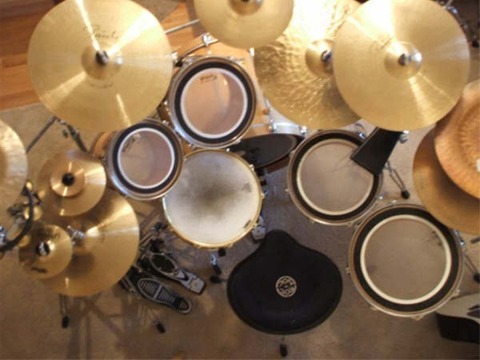 Lori has a wonderful setup here, with some really cool, small drum sizes! 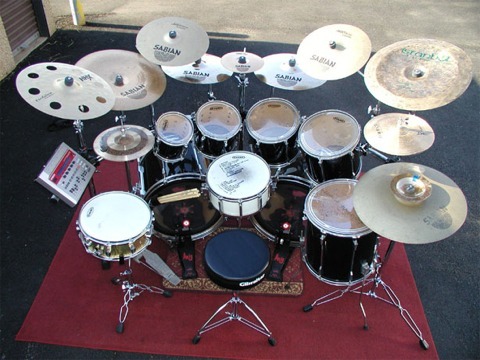 Among the cymbals are a 22 Masters Turk ride, 20 Masters Turk flat, 19 Armond ride, 17" crash, and a hard to see 10" Bos trad splash, mounted off the bass drum hoop! Mario sends this pic of his 22 Masters Turk, 18 Versa, and 20 Bos Trad Thin Ride in action...and some very pretty stage lighting! Well, out with the old, and in with the new! Rob decided to make some changes. Some of the turks went, in favor of Antiques, Masters, and a New Orleans. 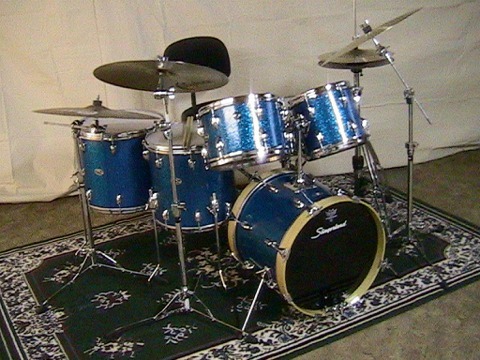 Pearl BRX in Ocean Sparkle (8, 10, 12, 14, 16, 22x18). 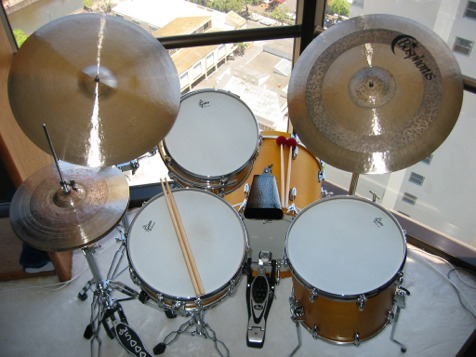 are amazing cymbals and sound perfect together. 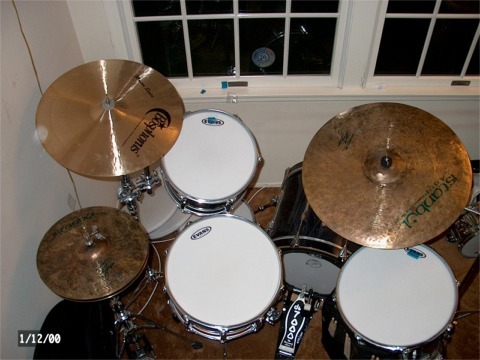 Jonathan's current cymbal set-up is all Sabian: 14" HH Manhattan Groove Hats, 16"
Manhattan Jazz Ride (2 rivets), 20" AA Raw Ride, 21" JoJo Mayer Fierce Ride. 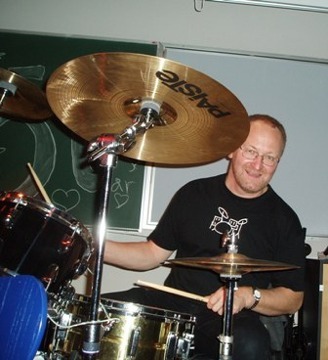 I am a 47 years old loyal Paiste-player, and has always been!! 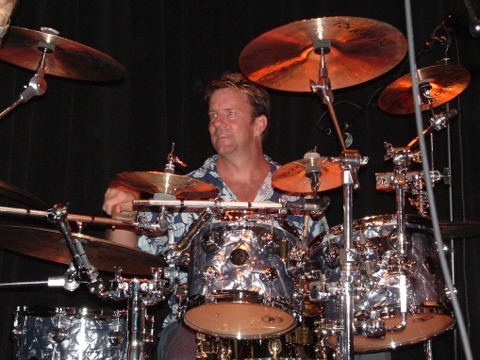 The Signature Line has always been “my cymbals”!. No other brand or line has never been in my mind – it is my ears to decide this - And I trust them!! 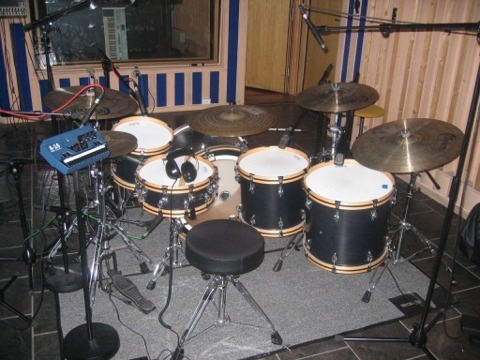 Drumkit: Yamaha Recording Custom with Yamaha Oak Custom bassdrum. 2 years later!) I get so many compliments on gigs it's funny! 13 inch turk hats...all %100 killer!!!! 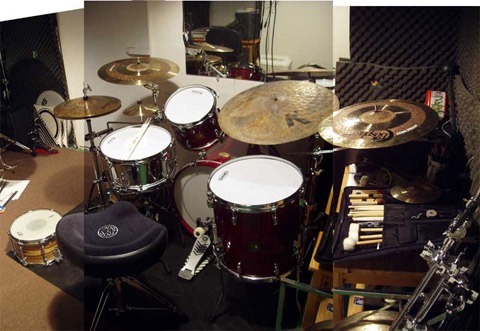 Bob's kit is a mix of some really great pieces. I know, because I've played them all when he was here!!! 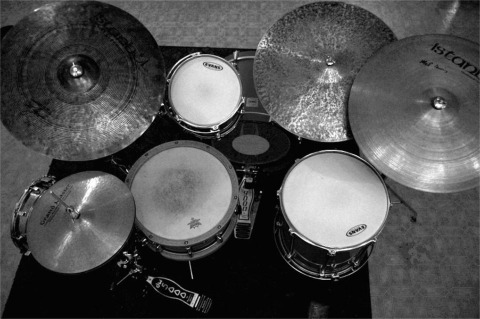 Left to right: 14" Grand Masters Hats, 22 Agop Sig, 21 Meinl Custom Jazz Dark Thin Ride, Istanbul Pre-Split Mel Lewis.